Sometimes there are not the words to capture fully the magic that is happening at a live theater performance. No matter how much a reviewer might try, the combination of the setting itself, the skilled nuances of the actors, and the spontaneous and genuine reactions of the audience all combine to make a special script come to life in a way that it demands to be experienced live in order to be fully appreciated. 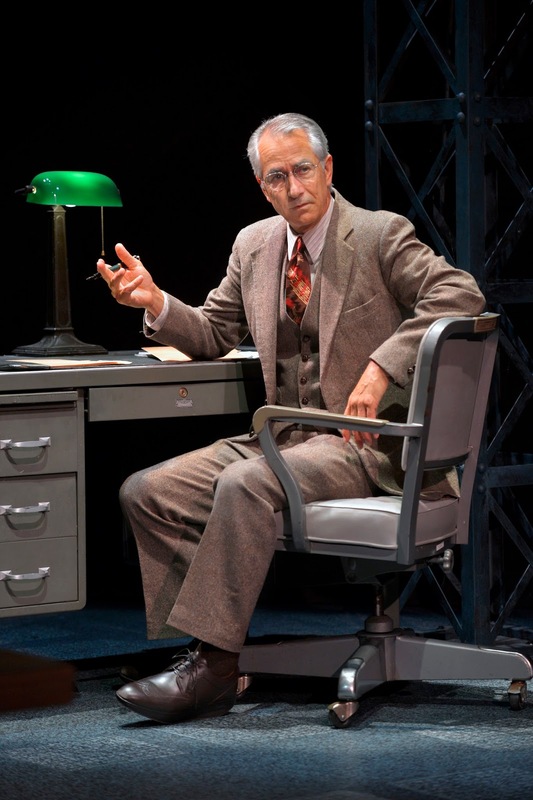 Such is the case for Joseph Dougherty’s new work, Chester Bailey, now in world premiere at American Conservatory Theater’s Strand Theater. Set in a Long Island, 1945 hospital, we meet one patient -- a twenty-something and chipper Chester Bailey -- and one doctor -- graying and distinguishably handsome Philip Cotton. Each begins to tell in back-and-forth fashion his story, both with meticulous details and sidetrack observations thrown in and both told in the appropriate style and accent befitting either a blue collar or a highly educated Long Islander. Somewhat random pieces of personal backgrounds, families, traits, and tastes spill out in short sentences, as each speaks directly to us, the unseen listeners. In his time off when he shows up in his civvies at bars full of guys in service uniforms, Chester learns to escape others’ judgments of him by instead hanging out anonymously in the grand and vast Penn Central Station. It is there that he sees her -- the rust-colored redhead working at a newsstand with a tropical bird on her blouse. That image of her and the five words she says to him (as he purchases paper and gum) in a high-voiced, musical lilt he excitedly imitates for us (“Here ya go, thank you”) are implanted deep in his mind’s eye will come back to save his sanity ... and maybe his life. 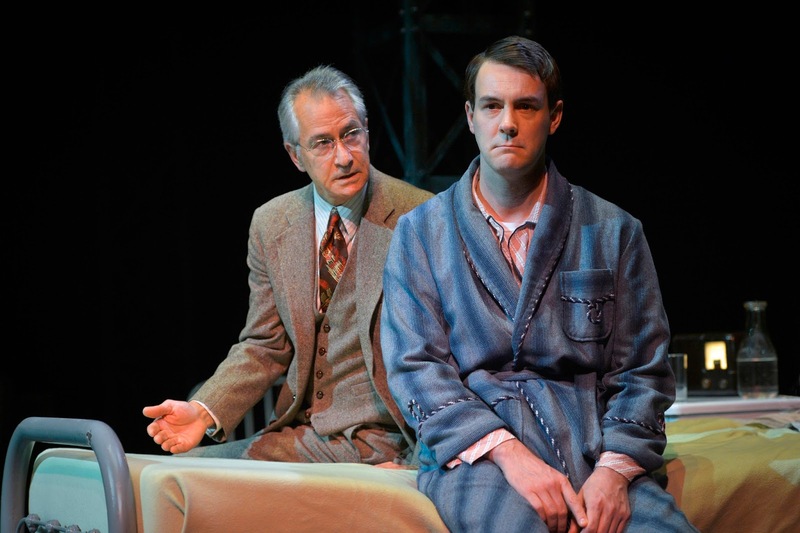 Dr. Cotton’s subsequent affair and its real and feared consequences peppers the rest of his interactions with us, the audience, while he relates to us Chester’s story. A tragic, crazed, oxy acetylene attack at the factory has left Chester minus one ear, his eyesight, and both hands. Chester, now in a state mental institution where the doctor recently transferred, believes what happened was a common industrial accident of a rivet falling into a hot bucket of varnish, causing an explosion. He also believes his sight is slowing returning (after all, he can see the Van Gogh print hanging on the wall) and that his hands still exists (claiming that others feed, clothe, and bathe him “because that’s what they do around here” for patients like him). His ongoing denial of what really happened to him becomes Dr. Cotton’s mission to erase. The sometimes funny, often gripping starts, stops, and sidetracks of their developing relationship continue to be intermingled with each telling us about illicit encounters with the ladies of their nights. While it is clear to us that Chester’s grip on reality is questionable, even the good doctor admits having trouble separating his own fantasy life from reality. In walking away from any one of the many roadside motels where he and Cora meet, he admits, “With every step, I lose reality with what I just did.” Over time, the more the doctor uses various ploys to force Chester to confront his harsh reality head-on and to accept his tragedies, the more Philip begins to question the importance or even wisdom of doing so. With paned skylights hanging in kilter high above, tall metal supports rising like giant redwoods, and a sole hospital bed and a wooden desk dominating two opposite sides of the otherwise blank stage, Nina Ball’s set design alerts us that big questions and themes are going to be introduced while focusing on two, personal stories. Robert Hand’s shifting lighting hues of blues and purples establish a dream-like atmosphere, dissected periodically by beams of bright light that draw attention to stark reality, notifying that the play is alternating between what is real and what is not. Ron Lagomarsino directs the constantly shifting timeframes, frames of reference, and scene frames with astute skill and sensitivity, cleverness and creativity. The two primary actors are nothing short than brilliant in their portrayals of two very different men drawn together by one man’s tragedy and one man’s drive to help. 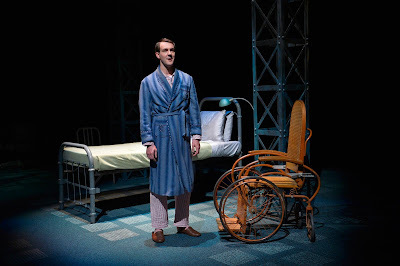 As Chester Bailey, Dan Clegg brings in his expression, movement, and voice an exuberance for life, a patience for letting that life unfold step-by-step, and a determination to survive as an independent thinking and acting individual with a hope for tomorrow. A blind, facially scarred, handless man should possess none of these; but Mr. Clegg’s Chester is a man who sees himself much more whole than the rest of the world does. His happy-go-lucky, boyish manners; his inquisitiveness and offered opinions; and his descriptions of discovering his sensual and sexual self are all masterfully brought to bear in giving us an insider’s look into a man undaunted by the bad cards dealt him. The power of Joseph Daugherty’s script centers in many ways on the journey Dr. Cotton takes to rid himself of biases against what he first sees as mind tricks to open himself up to seeing the mind as a canvas upon which any one can paint the picture needed for self survival and perhaps even happiness. Watching Dr. Cotton take that journey and make that discovery is one of the big joys and heart-touching aspects of this outstanding play. His conclusion that maybe Chester is “the author it his own story ... and an artist at that” is a profound, stunning, and emotional climax that challenges us all to investigate the judgments we make on the dreams, beliefs, and life stories others create for themselves -- or we, for our own selves. When a world premiere’s opening bears the finished, mature feeling of a well-traveled, much-toured production, then kudos goes all around to all involved. To this American Conservatory Theater cast and production team and especially to Joseph Dougherty go many congratulations for a jaw-dropping, heart-warming, thought-provoking, must-see Chester Bailey. Chester Bailey continues through June 12, 2016 at American Conservatory Theater’s Strand Theater, 1127 Market Street, San Francisco, CA. Tickets are available online at http://www.act-sf.org/ or by calling 415-749-2228.